Yes, you can still have pasta if you have diabetes! 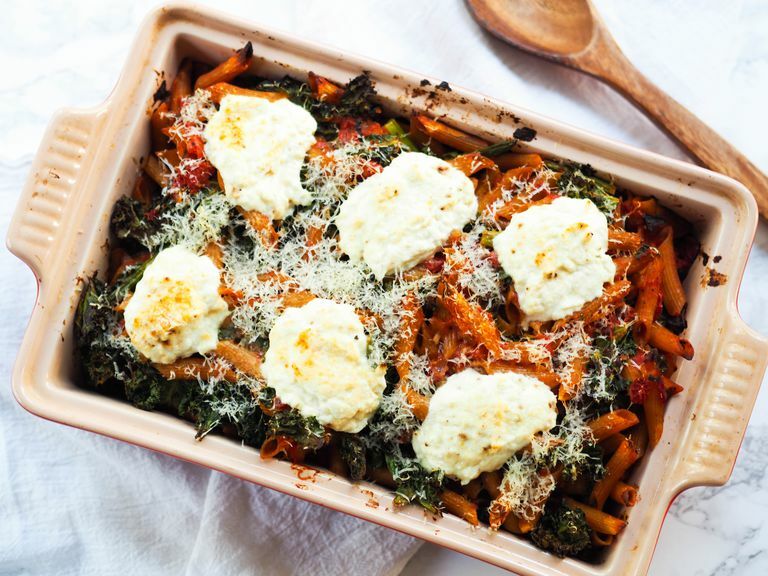 This comforting pasta casserole is made with fiber-rich whole grain pasta, which helps maintain healthy blood sugar levels. With sweet asparagus, bright basil, and dollops of lemon zest spiked ricotta, every bite tastes like spring! Bring a large pot of water to a boil. Add pasta and cook until slightly underdone. Drain and place cooked pasta back in the pot and set aside until ready to use. Next, make the sauce. Heat olive oil in a medium pot on medium-high heat. Add onions and garlic and saute until golden, about 5 to 7 minutes. Add tomatoes, salt, and pepper and simmer 15 minutes until thickened and flavors have melded. Stir in basil and turn off heat. While sauce is cooking, steam the vegetables. Rinse the kale off in a colander and transfer to a large microwave safe bowl. Heat in the microwave for four minutes then add to the pot with cooked pasta. Place asparagus in the microwave with 1 teaspoon of water. Microwave for 3 minutes until crisp tender. Add to pot with cooked pasta and kale. Pour tomato sauce into the pot with the cooked pasta and vegetables. Stir until well combined. Pour mixture into a large casserole dish. Mix ricotta cheese with lemon zest and juice. Dollop over the top of the pasta. Top with parmesan cheese. Place in the oven and bake uncovered for 30 minutes until casserole is golden on the top and slightly crispy around the edges. Many people with diabetes are afraid to eat pasta, but pasta can absolutely fit within a diabetic diet, especially when you choose high fiber, whole grain pastas. Look for ones that say 100 percent whole wheat or 100 percent whole grain, which are your best bet for blood glucose control. You could also use gluten free pasta. Ones made from brown rice or quinoa are also whole grain and beneficial for blood sugar control. There’s also lentil or bean flour pastas, which have the added bonus of being higher in protein. Just be sure not to overcook these gluten free pastas, which have the tendency to get mushy when overdone. For more protein, feel free to add a pound of lean ground beef, turkey, or chicken to the tomato sauce. Or, you could mix in leftover rotisserie chicken. To keep it vegetarian but up the protein content, add a can of drained chickpeas or white beans. I love the texture and slight bitterness the lightly steamed kale adds to this dish, but if you prefer more tender greens, swap in chard or spinach. If trying to make this dish on a weeknight, there are many time saving tricks you can employ. Use defrosted frozen asparagus and kale (or spinach), just be sure to squeeze the greens dry with a dishtowel to get rid of extra liquids before using. You could also swap jarred tomato-basil sauce—just look for one that’s lower in sugar. Don’t worry about finding one with zero grams of sugar though, since tomatoes naturally contain a small amount, and a pinch is often added to counteract the acidic taste. This is also a dish you can make ahead and freeze for later. Freeze the pasta in an ovensafe casserole dish. To bake from frozen, place it in a 375 degree oven and bake for about 60 minutes until cooked through and golden. Serve this with a simple side salad or slaw tossed with your favorite bottled dressing, or a simple mixture of balsamic or red wine vinegar and olive oil seasoned with salt and pepper.